📅 April 2019 April 9, 2019 by Bruno B. This is a comprehensive list of the 19 best things to do in Kyoto, Japan. Find also some logistic tips to help plan your trip to this unique place! Out of all cities I visited during my Japan trip, Kyoto is one with more charisma. 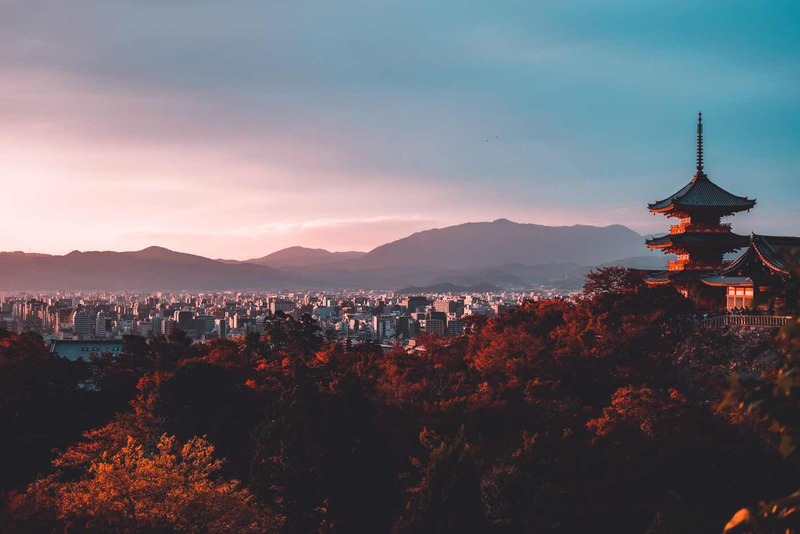 The cultural capital of Japan and former capital still breathes much of Japanese heritage and culture and transports you to the fascinating Edo period. I selected some of the best things to do in Kyoto, Japan, especially if it’s your first time. 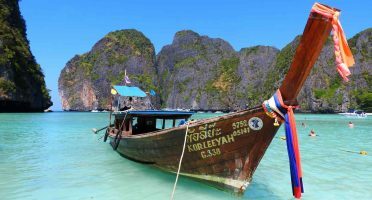 Further down the article, I’ve also added insider tips and practical advice to make the most of your trip. 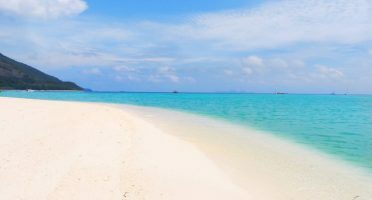 Including the best time to go, where to stay, how to get around and a first-time itinerary and map with all the sights. Check out this pre-filtered list of the highest-rated places to stay in downtown Kyoto. Instagram sensation Fushimi Inari Taisha Shrine (伏見稲荷大社) is one of Kyoto’s best-known attractions. 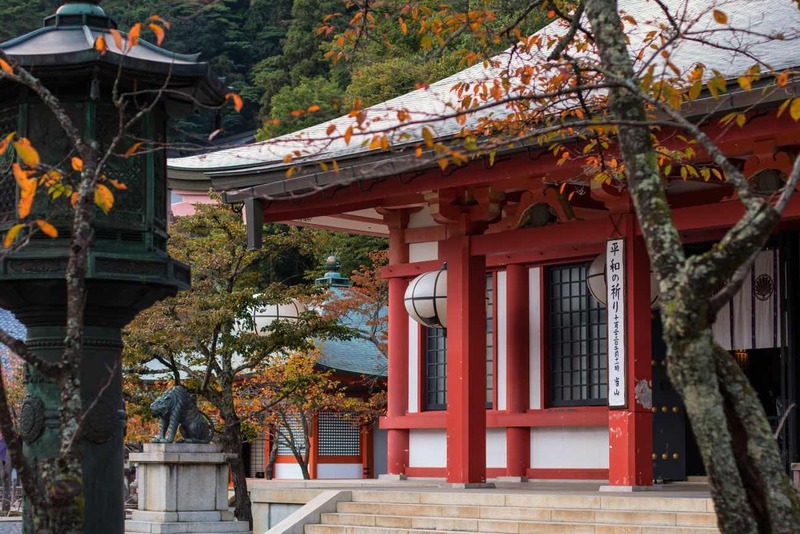 This shrine dedicated to Inari – the Shinto god of rice – contains a set of 12,000 blood orange gates in the forest connecting the main temple buildings. The orange torii gates were donated by the local community which gives it an even more special aura. If you can, make sure you go all the way up to the top of Mount Inari. You can have some decent views of Kyoto up there and it’s a once-in-a-lifetime hiking experience. Fushimi Inari Shrine is located in southern Kyoto, a few steps away from JR Inari Station, on the JR Nara Line. It should be a quick 5-min from Kyoto Station. You can also get there via the Keihan Main Line (Fushimi Inari Station). Admission is free and the site is open 24 hours/day. This place has HERDS of tourists any time of the year and your experience can be severely ruined if you don’t arrive early in the morning or late in the afternoon. We arrived there around 8 and it was a bliss to have this magical place for ourselves. In a city with 1600 temples (! ), we got to pick our battles with the risk of quickly get templed out. 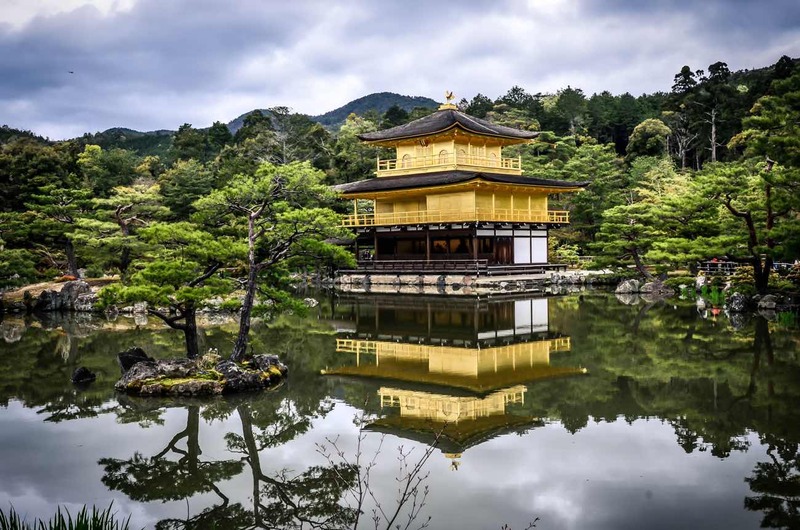 Kinkakuji Temple (金閣寺) is definitely worthy a visit. This temple in northern Kyoto covered in freaking GOLD LEAF. Overlooking a pond, this place is stunning from every angle or time of the year. The best time to go is early morning, when the sunlight lights up the whole structure and there are less crowds. One of the most popular day trips from Kyoto, the rural town of Kurama (鞍馬) is a must-go if you’re looking to relax in the middle of beautiful nature. Do the hiking trail to Mt. Kurama hilltop, visit Kurama-dera temple, and end your day relaxing in the Kurama hot spring. To get to Kurama, take the Eizan Railway from the Demachi-Yanagi Station. The journey takes about 30 minutes. There are plenty of Samurai and Ninja spots in Kyoto to learn bushido (the way of the warrior). One of them is Ninja Dojo. Not only you can dress up as one, but the interesting part is to learn how to use a Japanese sword, throw ninja stars, and other stealthy moves. 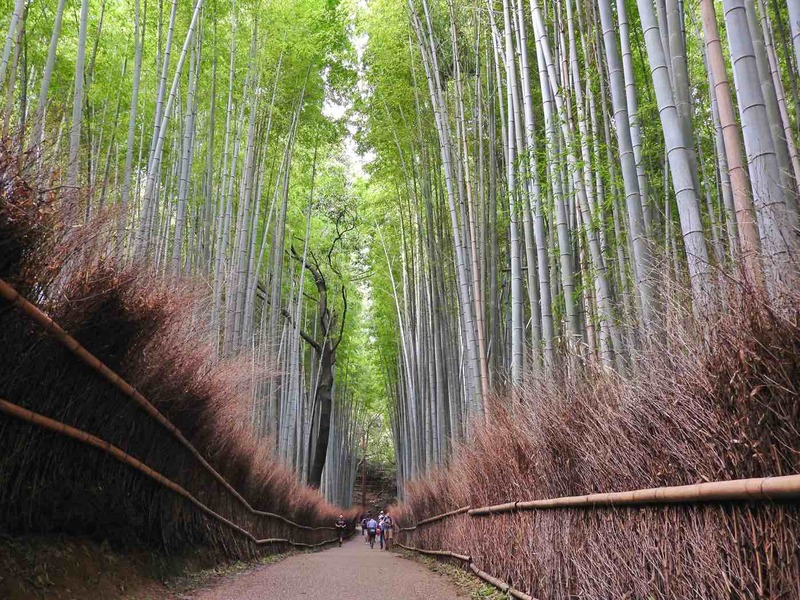 An iconic thing to do in the Arashiyama area is to visit the Arashiyama Bamboo Grove. Running between the Okouchi Sanso Garden and the Tenryuji Temple, this natural bamboo forest is one of the most photographed places in Kyoto. No photograph makes justice to the feeling of being amid these huge stalks of bamboo. It’s a particular unique sight to hear the soothing sound of stalks gently moving when there is a light wind or when the sun peeks throughout the dense canopy. Personally, this was one of the most photogenic and fascinating places I ever brought my camera to. The easiest way to get to Arashiyama is by taking the JR Train from Kyoto Station on the JR Sagano/San-in Line to Saga-Arashiyama. The bamboo grove is a short 10-minute walk away. You can choose to walk or bike and the admission is free. If you don’t mind the tourists, come over around midday for the best light of the day. But this place is magical on its own so I suggest to arrive as early as possible to avoid the tours with dozens of people. We arrived around 8h and there was already quite some movement. Dating back to the 8th century, Kiyomizudera Temple (清水寺, literally Pure Water Temple) is one of the most important monuments in Japan and a UNESCO World Heritage site. It’s set on a hilltop overlooking Kyoto and surrounded by hills and a forest of cherry and maple trees. If you come during spring or fall season, expect to see a beautiful color palette! Despite the crowds, this is one of my favorite places in Kyoto. 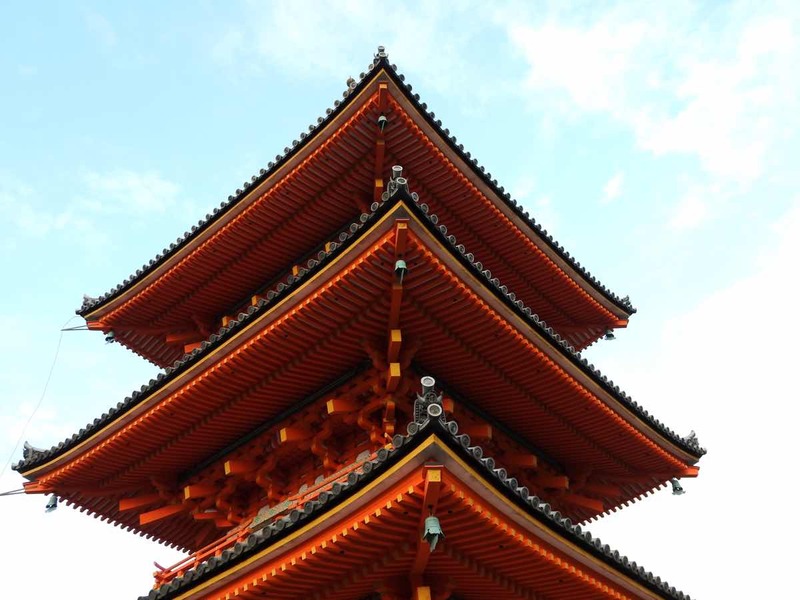 Kiyomizudera’s wooden main hall – built without a single nail! 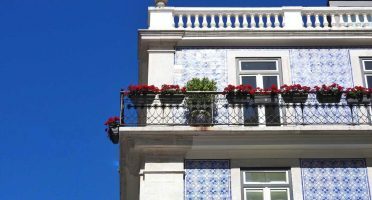 – is covered until March 2020 for the renovation of its roof. Kiyomizudera Temple is open everyday of the year, from 6:00 to 18:00 (until 18:30 on weekends and holidays from mid April through July and everyday in August and September). Fun fact: are you single? Walk from one between two stones with your eyes closed in front of the Jishu Shrine. If you can find your way from one stone to the other with your eyes closed, the god of love is said to bring you good luck in finding true love. This may be entirely random in a “things to do” list, but I don’t care. I loved so much the gyozas of Gyoza ChaoChao that they deserve an entry of their own. As a non-pork meat eater, I got ecstatic when I tried their chicken, shiitake, and curry gyozas. Sakura (桜) or cherry blossom season is arguably Japan’s main attraction and the country literally stops to see this nature blessing. There are dedicated forecasts for it in the news and even a special word for this activity: hanami means going picnicking next to cherry blossoms. And guess what – Kyoto is one of best places to be for the sakura season! If you are lucky enough to be around late March, early April, don’t miss out. Historical sites like temples and shrines hold special events and are popular for cherry blossom viewing.  Where to see cherry blossoms in Kyoto? Here are some of the most popular cherry blossom viewing spots in Kyoto. If you want to be serious about it, follow the forecasts for higher viewing potential. 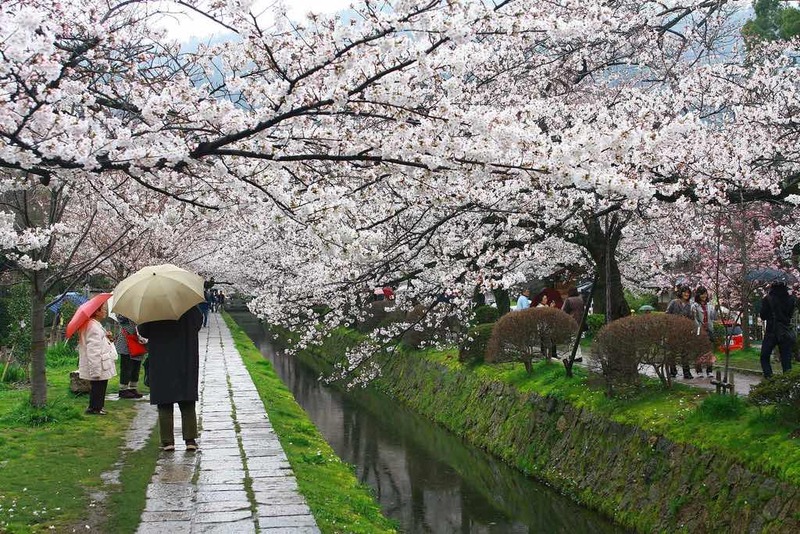 Philosopher’s Walk: this 2 km walking trail is lined with hundreds of cherry trees. When they’re all blossoming, they create a magical tunnel. Heian Shrine: one of the best spots to see weeping cherry trees in Kyoto. Don’t miss the nearby Okazaki Canal too. Maruyama Park: right next to Yasaka Shrine, this public park is popular to see the blossoms. The 12-meter high weeping cherry tree gets lit up at night. Togetsukyo Bridge: come to this bridge at the foot of Arashiyama mountains for a more natural experience of cherry blossom viewing. Haradani-en Garden: sort of a hidden gem located in the hills above Kinkakuji Temple, this private garden opens exclusively for sakura season. Haradani-en Garden: sort of a hidden gem, this private garden opens exclusively for sakura season. The district of Gion (祇園) is Japan’s most famous geisha and entertainment district. Alongside wooden merchant houses, teahouses, restaurants, – and now souvenir shops -, geiko (geisha in local dialect) and maiko (geiko apprentices) can be found roaming around their performance venues. The most popular area of Gion is Hanami-koji Street starting on Shijo Avenue and stretching all the way to Kenninji Temple. Get lost in the small streets and wonder at the well-preserved architecture. ℹHow to spot geishas in Kyoto? Geishas are more likely to be seen before dusk in the streets of Gion. They usually arrive by taxi so you can only have a sneak peek of them when they enter the ochaya (teahouses). I’ve marked a pin on this map to signal the area where they are more likely to be seen. If you are lucky enough to spot a geisha, keep in mind 1) you’re not a paparazzi 2) they’re not wildlife. Geishas don’t appreciate being photographed or interrupted, so please respect their private life and personal space. 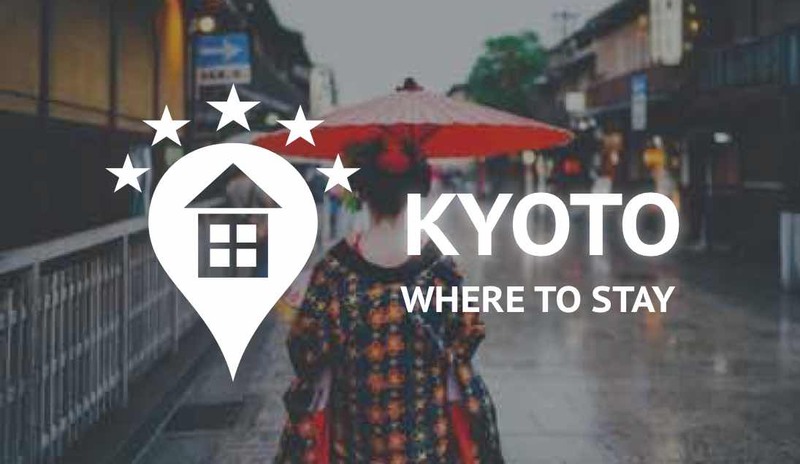 Check out this pre-filtered list of the highest-rated places to stay in the Gion district of Kyoto. 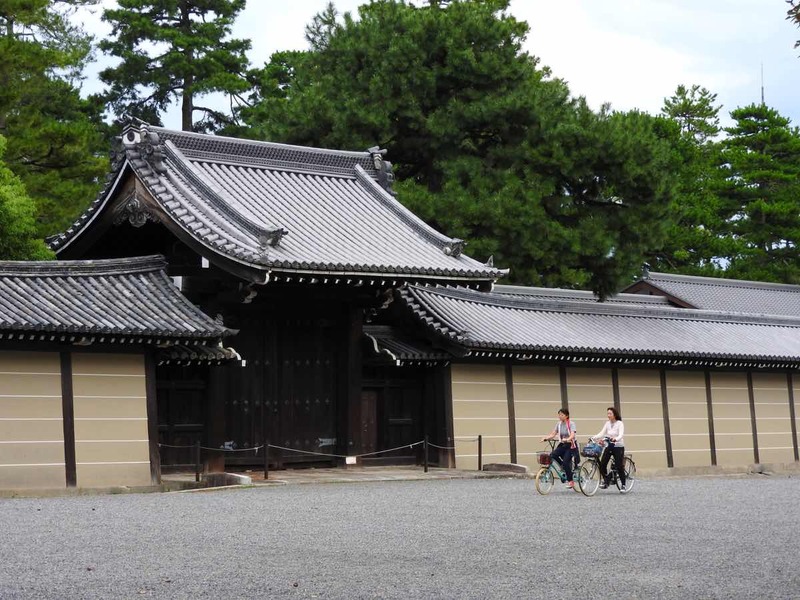 If I knew what I know today, I’d also probably choose bike to see the Nijo Castle grounds. Built as a residence of the first shogun of the Edo Period in 1603, Nijo Castle (二条城, Nijōjō) was afterwards used as an imperial palace for some years until being designated a UNESCO World Heritage Site. Yes, yet another one in Kyoto. Its well-preserved architecture provides insights into the palaces and castles of Japan’s feudal era. While it’s not as spectacular as the temples in the city, the scale of this place and the beautiful gardens make a stroll worthwhile. When you’re in a market where you don’t know what half of the things are. I’m a huge fan of markets when I travel. Out of all the markets I visited in Japan, Nishiki Market (錦市場) was the busiest, biggest, and liveliest. Stretching for a range of 5 blocks and with 100+ shops, stalls, and restaurants, this is known as Kyoto’s Kitchen. 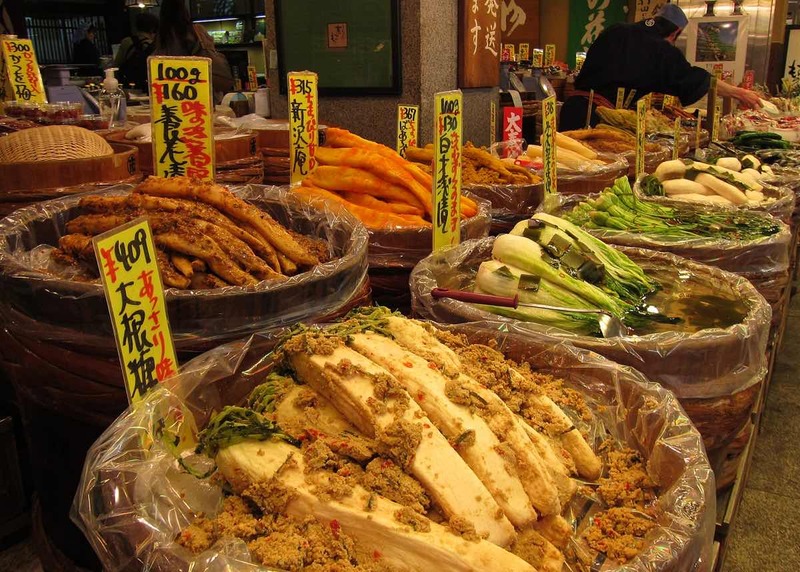 Almost everything is locally produced, from pickles, to seafood, from knives to Japanese sweets. Plus random food on sticks. Plus sushi and sashimi. A paradise for foodies! The main street of Nishiki Market runs parallel to Shijo Avenue and it’s a 5-min walk from the metro Shijo Station (Karasuma Line). The opening hours depend on each store, but usually from 9am to 6pm. Now for something completely different. 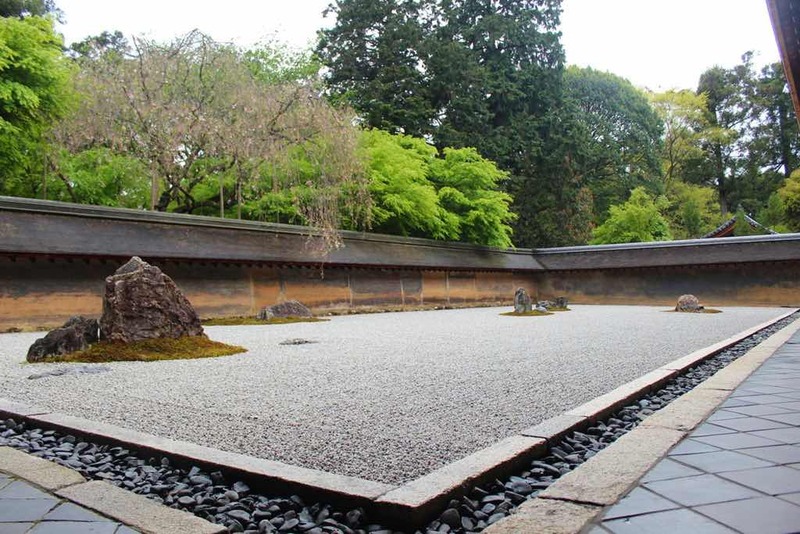 Japan’s most famous rock garden lies in Ryoanji Temple (龍安寺), a site that belongs to the Myoshinji school of Zen Buddhism. I understand the concept of going to a place to see rocks sounds alien to many, but hey, Japanese are the ultimate garden designers, so this should sound at least… interesting. Oh, and it’s an UNESCO World Heritage site too! One of the most popular activities and experiences to do in Kyoto: a authentic tea ceremony. In essence, it is a ritual in form of choreography of preparing, serving, and drinking Japanese green tea (matcha) together with Japanese sweets. As the cultural capital of Japan, Kyoto is home to the 3 main schools of chado (literally the Way of Tea). There’s a LOT more into this than you think. There is a proper way to clean the utensils, to handle the bowl, to boil the water, and even to decorate the room where it takes place. All is staged to enhance the bond between the guest and the host, in a contemplative and almost meditative experience.  Is it worth to do a tea ceremony tour in Kyoto? I did a tea ceremony tour with Airbnb Experiences and this is my two cents. It is definitely an interesting way to peek into the fascinating Japanese culture. For 45 minutes, you’re immersed in a world where all details, scents, and tiny hand movements matter. However, for something that I won’t probably ever replicate back at home, I find it a very expensive activity. If you are looking to ways to make your Japan trip cheaper, this should be one of the first things to cut out. If you have the money to splurge though, do it, it’s a once-in-a-lifetime experience. With 120+ native snow monkeys – yes, the same you see in photos bathing at hot springs in winter -, Arashiyama Monkey Park (also called Iwatayama Monkey Park ) is another of the highlights in the Arashiyama area. It’s far from being a zoo (which I avoid at all costs), but more like an open park in the mountains where monkeys roam freely. They’re used to humans although you should be careful not to stare at them or scare them in any way. Oh did I mention it has a beautiful wide open view of Kyoto too?! The park is a 5-minute walk from Hankyu Arashiyama Station and a 15-minute walk from JR Saga-Arashiyama Station. You can find the entrance to the park is right next of Togetsukyo Bridge. 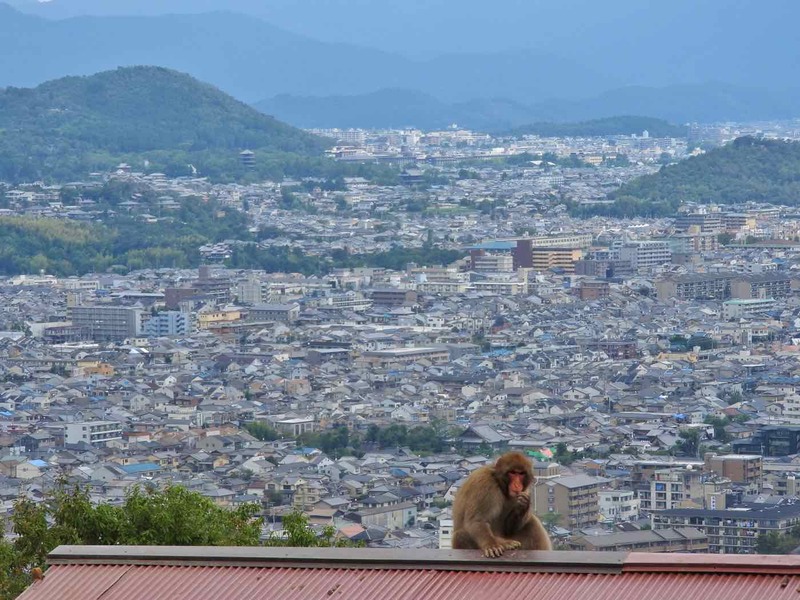 After buying the ticket – 550 yen – you’ll need to hike uphill for a good 15-20 minutes to reach the open area where the monkeys are. Pontocho (先斗町) is a narrow lane sided by restaurants in downtown Kyoto, stretching from Sanjo-dori to Shijo-dori. Even though there are some inexpensive traditional options – think yakitori – this area is strong with a wide range of places offering fine Kyoto cuisine. Don’t get me wrong though – this a touristy area and prices can be high. 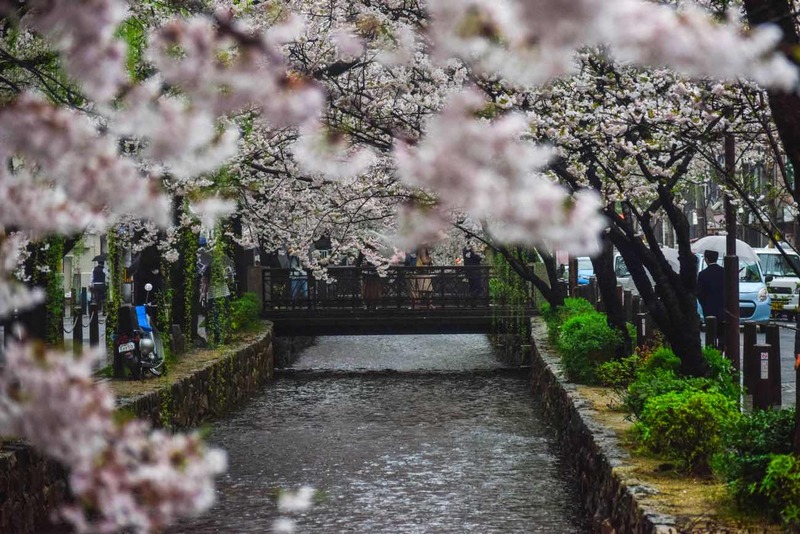 Known as place of introspection and meditation, the Philosopher’s Path (哲学の道) in Higashiyama district follows a canal lines with 500+ cherry trees. It connects the neighborhood of Nanzenji with the Ginkakuji (Silver Pavilion). This is perhaps the best spot in the entire Japan to be during the cherry blossom season. If you’re looking for a less crowded temple in Kyoto, go to the Eikan-do Zenrin-ji Temple (禅林寺 永観堂). It’s a peaceful place to enjoy Japanese architecture and relax amongst maple trees, koi fish, and also one of the most incredible places to see the foliage change colors during fall season. 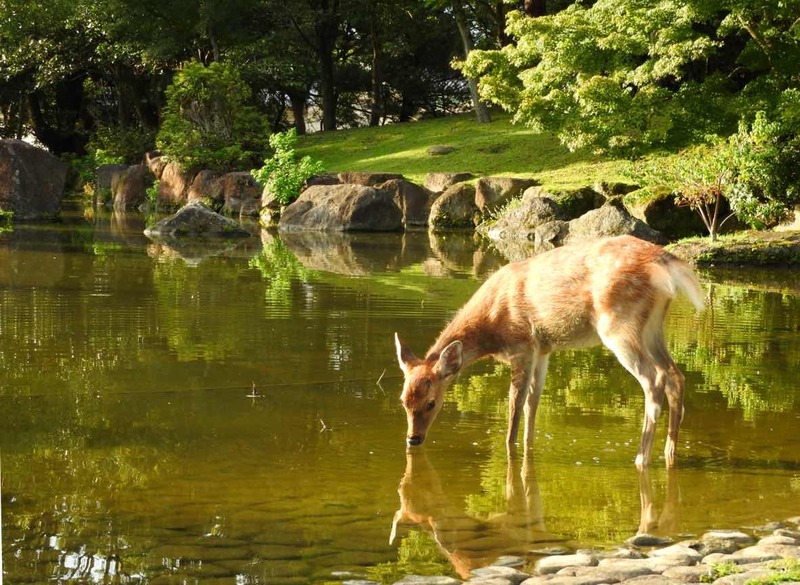 National Geographic scene in Nara. Even though this one is not exactly in Kyoto, it’s an unmissable one. Spendat least a full day in Nara (奈良). This was one of my absolute favorite places in Japan – if not my favorite! – and trust me, it can be a fantastic and magical day trip. Nara was Japan’s first permanent capital and boasts some of the country’s most amazing temples, shrines, and sights. But the real stars are the thousands of deer that roam freely around the grounds of the temples, parks, and even roads. If you have more time, consider staying there overnight, for more chances to explore the temples like Tōdai-ji and Kōfuku-ji once all day visitors are gone. If you have the JR Pass, the JR Nara Line connects Nara and Kyoto and the trip lasts 45 minutes. You can hop on the train in Kyoto Station and the fare (around 700 yen) is fully included in the pass. Try to get an express train (kaisoku) instead of a local train (futsu). Limited express trains from the private line Kintetsu also connect the two cities (Kintetsu Kyoto Station to Kintetsu Nara Station) in 35 minutes. The fare is 1130 yen. One of the most iconic traditions in Kyoto is Kawadoko, which loosely translates as something as escape the heat to a cooler place. The best place for this is the riverbank of Kamogawa River (鴨川), where restaurants and cafés extend their terrace during summer. Not exactly cheap, but hey, cooling off and indulging in local Japanese cuisine at the same time has a price. As you can see from the map, the sights in Kyoto are (too) dispersed across very different areas. Public transport doesn’t always make the best job in connecting them. This means that is key to choose the right place to stay, plan out your days, and learn how to get around. The next sections will help you. In some moments of the day, Kyoto is magical. Kyoto is a much bigger city – than I anticipated anyway – so it’s key to maximize your mobility. Study the metro and bus lines and check the best ways to get to the main attractions. The downtown area around Pontocho and Nishiki Market is definitely the most busy and commercial and has great public transport connections. If you want something more unique, but pricier and more turisty during the day, stay in Gion. Or just go local. I found the area I stayed around Nijo Castle quiet and a refreshing peek into the way of living of Kyoto. In the morning, I enjoyed seeing local Japanese in suits leaving their homes mounted in their bikes. This is how you can group the above sights into day plans. You’ll need at the very least 4 full days in Kyoto. Day 1: Start by exploring the Arashiyama area – including Bamboo Grove and Monkey Park – in the morning. In the afternoon, relax in the Kamogawa river area and explore Pontocho Alley before dinner. Day 2: Priority is to as early as possible to Fushimi-Inari Taisha Shrine to beat crowds and then the Kiyomizu-dera Temple. 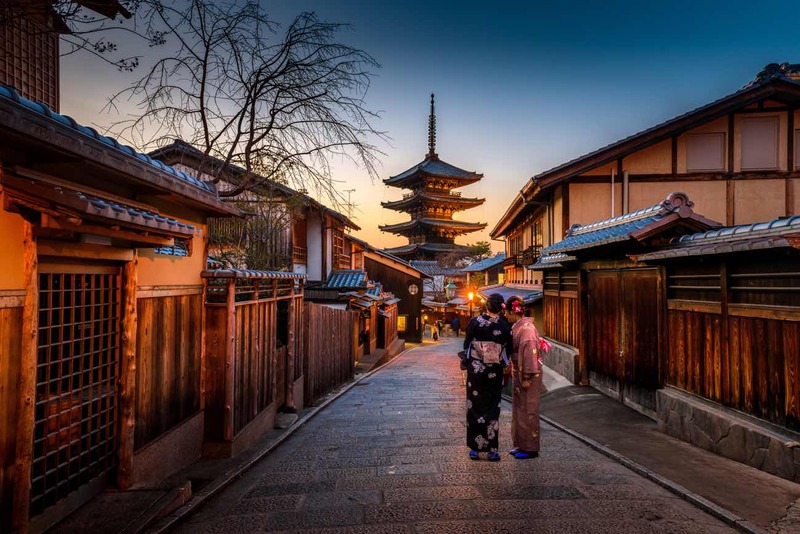 Walk down the Ninenzaka or Sannenzaka streets and then explore the Gion district at dusk. Day 3: Day trip to Nara. Day 4: Get early to Kinkakuji and to Ryoanji temples. Visit Nijo Castle and Nishiki Market on your way back to the center. Head to Eikando Temple afterwards and end your day relaxing (and meditating?) at Philosopher’s Path. Kyoto is a MUCH larger city that I expected and to be honest, I found it a bit tricky to navigate the public transportation system. In compensation, it is very bike-friendly: everything’s flat and most attractions are at a maximum of 30-min distance by bike from the center. 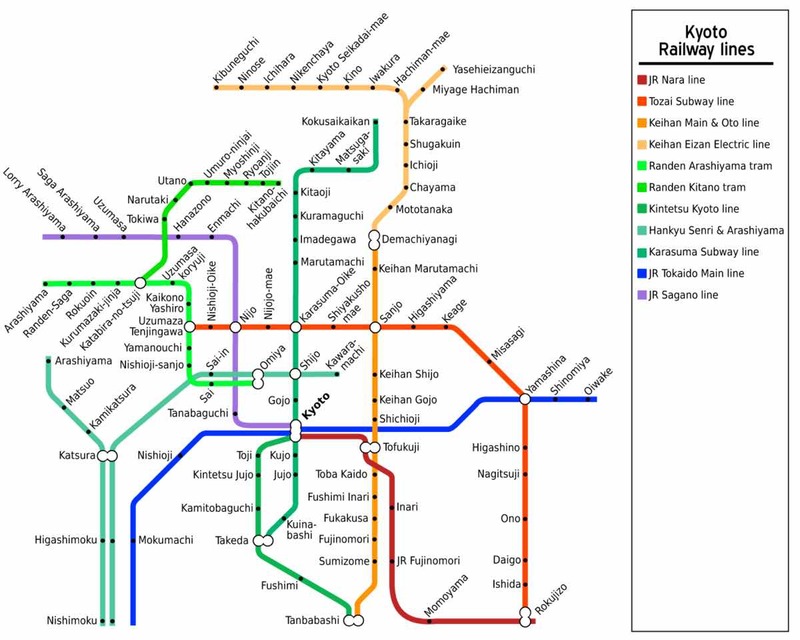 You’ll probably need to use Kyoto’s public transport system though. If you have a JR Pass, the JR Rail Line in Kyoto can take you to the majority of sights, including places outside the city like Nara and Uji. But trains won’t cover all of the main sights. I found that you’ll need to use the buses and/or one of the 2 subway lines. In Kyoto, buses cover the entire city and you enter the buses from the back and pay when you exit, at the front. In all cases using a Suica card – or any other prepaid IC card – is highly convenient for contactless payment. Like the entire Japan, Kyoto has reasons to visit in any time of the year. That said, try to avoid peak winter and summer seasons as crowds and extreme weather can be unbearable. Come during spring for mild weather and also for a chance to wonder at blooming cherry blossoms. A bucket list experience for sure, although it comes with inflated prices. The best time to visit Kyoto would be fall (September-November), when the temple gardens are filled with a stunning warm red, orange, brown, yellow color palette from the leaves. I was in Kyoto at the time the very first transition to fall colors was happening – I just wish I was there to see how it played out. What else would you recommend to do in Kyoto?